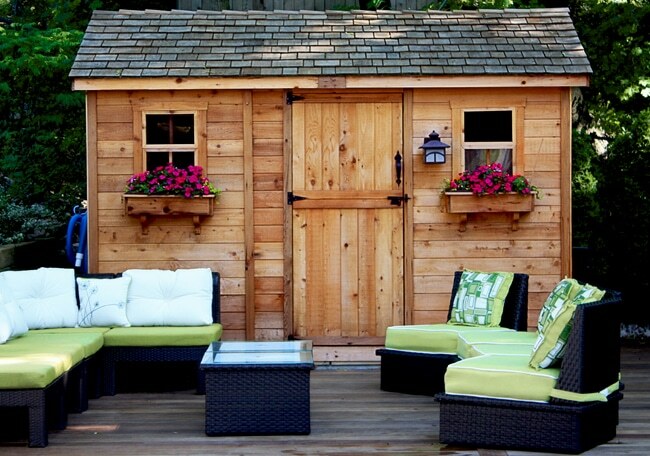 Wooden sheds and furniture all require the right care to ensure that they have a long life. Caring for your wooden outdoor structures not only increases their lifespan but also gives them a well maintained, aesthetically pleasing look. Wood is one of the most beautiful of all materials to construct with and can convey a look of refined elegance. Most of the time, minimal and regular maintenance, prior knowledge of the problems that can occur, and a sharp eye can decrease the costs from damage caused by negligence. Wood and water are not really enemies. They are actually pretty compatible. Many historical buildings constructed from wood still stand in all their glory. The ancient temples of Japan and China stand testimony to this. It is only when there is a prolonged exposure and contact to water that problems arise. The best way to avoid this is at the planning stage itself. Design wooden sheds such that they sheds water easily. Watch out for the trapping of water at the joints. Add sufficient overhangs and water drainage systems to minimize exposure to water. Mold and decay are best nipped in the bud. As always, here, prevention is better than cure. It is generally difficult to spot decay as it happens in corners, hinges, cracks, and holes. And once it is big enough to be spotted, it’s already too late for damage control. Be vigilant and inspect for rotting and decay periodically. Some things you can do to prevent rot in wooden sheds is to use decay resistant and pressure treated wood. When purchasing a wooden shed, always check whether the wood has been treated properly and the type of treatment it received. Water based treatments don’t provide the best protection. Choose a suitable treatment for your needs. A well cared for garden shed needs to be treated only once in 2-3 years. Don’t wait for it to show signs of dampness to decide that it is time for treating. Wood contracts and expands based on the amount of moisture it absorbs from its surroundings. This moisture can be from humans, plants, atmospheric and climatic conditions. In winters, wood is particularly prone to warping and can lead to creaky floor boards and difficult to shut doors and windows. To control warping you need to select wood that has already been dried and seasoned. Wood in its natural form is wet and if worked with in this condition will lead to bending, shrinking, and warping. Other ways to control warping are to keep room for mobility and create grooves that provide space for expanding and shrinking without cracking. Smooth and seamless surfaces make for easy cleaning. Dust and grime will not have any place to hide. You will just need to dust the surface lightly every once in a while without ever having to scrub corners and wedges. Use a planer and sander to create smooth surfaces and then polish it for that perfect finish.Wooden flooring can be sanded several times depending on the thickness of the wear and tear and your floor will last for several years. While planning your shed’s construction, consider the best position is for its location. It should be positioned such that the exposure to the elements in terms of its vulnerability is most minimized. Place the wooden shed so that it is sheltered from high prevailing winds, rain, and snow. Provide sufficiently large roof overhangs. Add projecting window sills and drip edges. Restoring your wooden outdoor furniture is a marvelous DIY project. The best aspect about wooden outdoor furniture is that it can be given a new lease of life with a little work on restoration. And then it’s as good as new. It isn’t that labor intensive and can be done in a days’ time. For general care just clean your wooden outdoor furniture with some soapy water. Use mild cleaners otherwise you might damage the finish. If it needs extra cleaning sand it lightly and brush away any dust that might remain on the surface. After you have cleaned it you now have the option to either oil it, paint it, or leave it as is so it transitions and ages naturally into that weathered look. Keep your costs low by checking up on your wooden structures and maintaining them so they last. Renewal will cost more than maintenance. Easy care means that cleaning can be carried out efficiently with minimal usage of resources and energy. Always be observant and keep a sharp eye out for any danger signs. It doesn’t mean that you have to constantly worry about damage. Inspect for danger signs every other week or so. Repeated observation will help you get the hang of how things are supposed to look and feel. After a while it will take just a glance to know that something is wrong.